If you are looking for a combination of desert landscape and beautiful mountain ranges, then you will find no better match in the national park system then Big Bend National Park. Sitting right on the border of the United States and Mexico, with the beautiful Rio Grande River as a Southern border, Big Bend National Park offers visitors a stunningly beautiful high desert landscape to explore. In this guide, I will lay out everything you need to know to make your visit to Big Bend National Park a success. I will explain how to get to the park, discuss the best times to visit, list the top attractions to see within the park and assist you in locating the best place to stay during your visit. In an effort to give you all the resources you need to do your planning, I have also linked to a number of other valuable resources that you can use to plan your trip. Big Bend National Park is located in Texas along the United State’s southern border with Mexico. In fact, the Rio Grande River, which makes up part of the border between the United States and Mexico, is also the southern border of Big Bend National Park. If you are traveling to Big Bend National Park from out-of-state or from outside the United States, the easiest way to get to the park is to fly into El Paso, Texas and then drive. 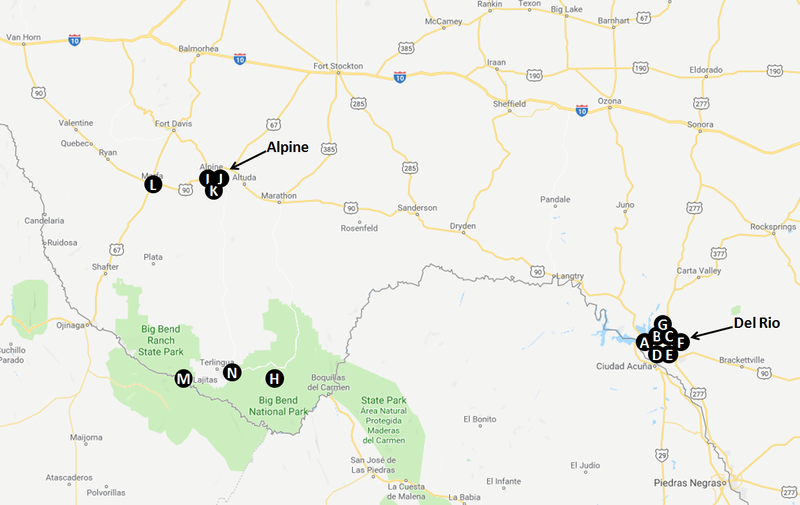 However, if you are visiting other cities in the region and would like to work in a trip to Big Bend National Park during your visit, I have included the driving distance to the park from several other large cities in the region in the table below. Big Bend National Park is also in relatively close proximity to a number of other national parks and monuments in the region. These include Saguaro National Park in Arizona, Guadalupe Mountains National Park in Texas, and Carlsbad Caverns National Park and White Sands National Monument in New Mexico. 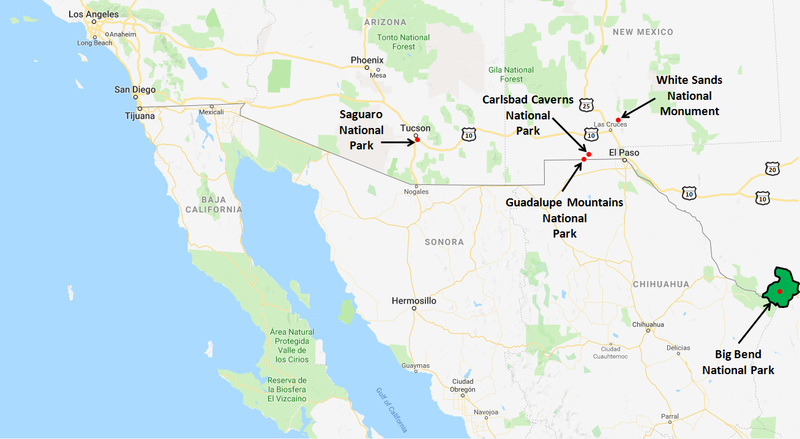 To better understand where these national parks and national monuments are in relation to Big Bend National Park, please refer to the map I have included below. Big Bend National Park is a large park with a lot to see so you will want to make sure you have a good idea of what you will want to see and do before you get to the park. I recommend that you plan to spend at least one full day at the park in order to see all of the main attractions, with an extra day or two planned if you are going to be doing an extensive amount of hiking. To give you a better sense of how large the park is and where all of the key attractions are located, I have included a park map for you to reference below. Big Bend National Park’s geography is a mixture of desert and mountains, as the park is both a part of the Chihuahuan desert and home to portions of the Chisos mountain range. Because of this varied landscape, the weather can be quite different in different areas of the park. While it may be scorching hot on the desert floor, the temperatures might be much more mild in the high country of the Chisos mountains. The best times to visit Big Bend National Park is between late fall and early spring when the temperatures are much cooler and the weather is dry. If you want to have the park all to yourself, then the very best months to visit are December and January. Not only is it much cooler during these months, but there aren’t as many people in the park as there are during the spring and fall months. The temperatures at Big Bend National Park can get really stifling hot during the summer, with temperatures routinely topping 100 degrees Fahrenheit (or 38 degrees Celcius). If you are going to visit Big Bend National Park during the months of May thru August, it is recommended that you carry a lot of water with you, especially if you are going to do an extensive amount of hiking. The months of November thru March typically have much more modest high temperatures, but it can get quite cool at night. In fact, it isn’t unheard of for the temperature to fall below 32 degrees Fahrenheit (or 0 degrees Celcius) at night during the winter months. If you are going to visit Big Bend National Park during the winter and plan on doing some camping, you will want to make sure that you are prepared for these cold nighttime temperatures. Because Big Bend National Park is a high desert climate, the park typically doesn’t see a whole lot of rainfall during the year. What rain the park does get typically falls during the Spring and Summer months of May thru October. Between late fall and late spring, the park sees very little rainfall at all. If you are planning on visiting Big Bend National Park during the summer months, you should be prepared for the occasional rainstorm that may come thru the park. Although most storms do not last that long, you will want to be prepared for bad weather if you are going to be in the backcountry or in the high regions of the park. Safety should always be your primary concern. With roughly 440,000 visitors a year coming to Big Bend National Park, it ranks in the bottom third of the most visited national parks in the United States (41st of 59 parks in attendance). This has far more to do with how out of the way the park is then it has to do with the quality of the park. Big Bend sees a majority of its visitors between November and April when the temperatures are much cooler. During the summer months when the temperatures can become repressive, there is a steep decline in the number of visitors. If you are going to visit during the cooler months, you will see more people on the trails and at the viewpoints, but the park is big enough where you will never feel overly crowded. Big Bend National Park is a bit off the beaten path, but it isn’t completely isolated to itself in the United States. There are several other national parks and national monuments that are within driving distance of the park. To give you an idea of what else is available to see in the region, I have included some suggestions below for you to review. Big Bend National Park is a bit off the beaten path, so there isn’t an abundance of places to stay right next to the park. If you would like to stay within the park, there are plenty of places where you can camp if you are into camping or there is the Chisos Mountain Lodge, which is within Big Bend National Park itself. Otherwise, if you are looking for a hotel your best bets will be to stay in the nearby towns of Del Rio or Alpine, which are 3.5 hours and 1 hour away respectively. In order to make your trip to visit Big Bend National Park a success, I have included a number of additional resources below that you can use to plan your trip. In addition to the park itself, there are a lot of really fun activities that are available to do in the Big Bend National Park and the surrounding area. To give you some ideas on activities you can do, I have included a list of fun excursions and activities below for you to review. Big Bend National Park is a beautiful park with a lot of amazing things to see. To give you some ideas as you put together the itinerary for your visit, I have highlighted some of the top attractions inside Big Bend National Park and in the surrounding area for you to review below. Seeing the Rio Grande River is such a neat experience. As you may know, this river makes up a portion of the Southern border of the United States on the border with Mexico. It is also the Southern border of Big Bend National Park, which means that Big Bend is literally right on the border with Mexico. There are a number of viewpoints where you can get some really great views of the Rio Grande, but my favorite is undoubtedly the Rio Grande Overlook near the Rio Grande Village. Santa Elena Canyon is my favorite thing to see in Big Bend National Park, and for good reason. It is an absolutely breathtaking slot canyon that was created by the Rio Grande River that you are able to hike into. The trail into Santa Elena Canyon isn’t very difficult, so it is a hike that hikers of all skill levels can enjoy. This is definitely a site that you should have near the top of your list when you visit Big Bend National Park. Considered by many to be the most beautiful drive in Big Bend National Park, the Ross Maxwell Scenic Drive should be on the list of every visitor to Big Bend. This paved road will take you by many of the scenic spots in Bend Bend National Park, which includes the Sotol Vista Overlook, Lower Burro Mesa Pouroff, Mule Ears Viewpoint, and Tuff Canyon, among others. According to the US National Parks Service, Big Bend National Park is a “Paleontological Paradise“, with the fossil remains of many different reptiles and ancient sea creatures being found within the park. In addition to the many fossilized seashells that you can see while hiking the Santa Elana Canyon trail, there have also been numerous dinosaur fossil discoveries within the park as well. If you are interested in learning more about the fossil discoveries during your visit, make sure you check out the Fossil Discovery Exhibit when you’re there. The Rio Grande Village is an area of Big Bend National Park on the border with Mexico where the old Boquillas mining settlement used to exist. The Rio Grande Village has one of the best campgrounds to stay at within Big Bend National Park and is also in close proximity to the Boquillas Warm Springs, which is a popular hot spring within the park. If you are interested, you can also cross into Mexico to visit the town of Boquillas del Carmen for the day at the crossing near the Rio Grande Village. Located near the Chisos Basin Lodge, the Window is a gap in the mountains that allows you to see miles beyond it to the desert valley below. It is an absolutely stunning view that you won’t want to miss when visiting Big Bend National Park. If you are up for it, you can also hike the Window Trail to get some better views of the mountains and the valley beyond them. The trail is a moderately difficult 5.2-mile out-and-back with just shy of 1,000 feet of elevation gain. If you are looking for a unique activity to do within the park, you might want to consider visiting the hot springs and taking a soak. Thermal features heat the water in the spring to around 105 degrees Fahrenheit, which makes it the ideal temperature for soaking to soothe sore muscles after a day or hiking or exploring. Before you visit, make sure you read the rules carefully so that you can help ensure this amazing feature can be enjoyed by other visitors for years to come. When temperatures get too hot on the desert floor, you can escape the heat by taking a hike up into the Chisos Mountains. One of the most popular mountain hikes in Big Bend National Park is the Lost Mine Trail. A moderately difficult 4.8-mile, round-trip hike, the Lost Mine Trail takes you thru some of the most beautiful areas of Big Bend’s Chisos Mountains. On this trail, you will get some great views of Casa Grande, Juniper Canyon, and other remarkable landmarks. While you will likely want to spend a majority of your time inside Big Bend National Park exploring, you shouldn’t miss out on some of the other interesting sites that sit just outside of the park. Arguably the most interesting of these is the Terlingua Ghost Town, which sits just North of the Western edge of the park. While I am not sure there are actually ghosts inhabiting the town, it is the remains of the old Chisos Mining Company’s settlement, so you never know. If you like history, you will love exploring this abandoned old town and taking a walk back in time as you see how the settlers lived when this town was bustling with people. Boquillas del Carmen, or more commonly referred to as just Boquillas, is a Mexican town that sits on the United States Border, adjacent to Big Bend National Park in Texas. If you are looking for a fun side excursion when visiting Big Bend, visiting the town of Boquillas for lunch or to do some shopping is an excellent choice. To enter into Boquillas, you will need to use the Boquillas Crossing Port of Entry. The hours of operation for the border crossing are listed below for your reference. Important Note: Be sure to have your passport with you and ready when you get to the border crossing and make sure that you return to the border crossing during the hours of operation to cross back into the United States. If you don’t, you will need to spend the night in Boquillas. Big Bend National Park is such a beautiful collection of conflicting landscapes for you to explore. From the Chisos Mountains to the Chihuahuan desert, the landscape seems to change as you navigate from one part of the park to the next. Below is a gallery of some of the pictures I was able to take of this beautiful park when I visited. Thanks. That makes me homesick as I grew up in El Paso. Big Bend has really changed. 40 years ago you needed to be really careful to not run into bandits and others who his out on the mountains. Cool place; I need to go back. Thanks for reading Tim!! It is fascinating to hear you talk about the history of the park. Those must have been crazy times. I can’t imagine having to dodge bandits in a park. It was extremely isolated back then, and of course being on the border so far from civilization, the mountains offered good refuge for a few folks who were shall we say living off the grid. I haven’t been there since I was young. Now I want to go back. Awesome!!! I love the isolated parks the most. Thanks for the great info Tim! If you like isolated parks, have you ever been to Natural Bridges National Monument in southern Utah? Really spectacular scenery and way off the usual routes. I have! It’s amazing! Southern Utah is my favorite. It is great. The park is so cool, but you almost have it to yourself. I love it. I have not made it there yet. Good to know. Thanks.